Mottainai is a Japanese word used to express "a sense of regret for wasting or underutilizing the full potential of something". If you use disposable chopstics, for instance, that's something that would be considered "mottainai". In fact, so much of what we do in modern society is mottainai. Recognizing what is mottainai in our daily lives is the first crucial step in the path to wise resource management and evironmental conservation. This concept of Mottainai was nurtured into a sloagan to promote the Reuse, Recycling, and Reduction of waste by Nobel laureate Wangari Maathai and has now grown into a global environmental movement. 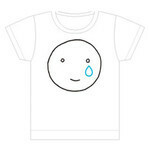 If Mottainai saddens you too, spread the word and support the Mottainai cause by wearing one of these cool campaign T-shirts. They're all-natural organic cotton! Hand washing is recommended. Fabric may shrink a little when machine washed. Avoid using chlorine based bleach and fluorescent brightening agents. Because the fabric is not bleached or chemically washed during production you may find some cotton chaff (residual bits of cotton leaf or stalk). This is an inevitable characteristic of organic cotton products should disappear after a few washes. Please use a piece of cloth when ironing over the printed design.